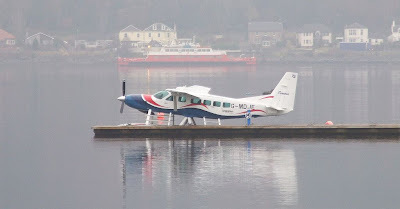 An unusual visitor to the Holy Loch Marina today was Loch Lomond Seaplane's Cessna 208 Caravan I seaplane, G-MDJE. Its arrival at Sandbank was due to poor visibility on the upper river, her normal touchdown point on her Glasgow-Oban scheduled service. This particular plane was built in 2001, and acquired from North American owners in June 2007. The Oban service commenced in August, carrying up to nine passengers at a time. In the background, berthed at Kilmun pier on the north shore of the Holy Loch, is Western Ferries' SOUND OF SCALPAY.